Everyone knows that Miley Cyrus is obsessed with animals, so it didn’t come as much of a surprise when, during a crazy 4th of July party in 2014, Miley got a side tattoo to commemorate her late dog, Floyd, who was killed by a coyote earlier that year. But now Miley Cyrus has debuted what appears to be another dog tattoo, and this one seems to be completely random, much like the other tattoos she has revealed recently. Once you hear about the inspiration behind this new dog ink though, you may be convinced that Miley Cyrus’ tattoo is actually the real deal. In the midst of news that Miley Cyrus and Liam Hemsworth are not only back together but engaged, more than two years after originally calling it quits, the famously wild pop star took to Instagram to show off some new ink on her arm. The possible new tattoo for Miley features a cartoonish head of a dog located at the top of her right arm, near her armpit and the claw arm tattoo she had inked back in 2013. Miley captioned the Instagram snap “@benjamjones @twinkleswinkle puppy,” which, in true Miley Cyrus style, did nothing to explain the meaning behind the (possibly fake) tattoo. 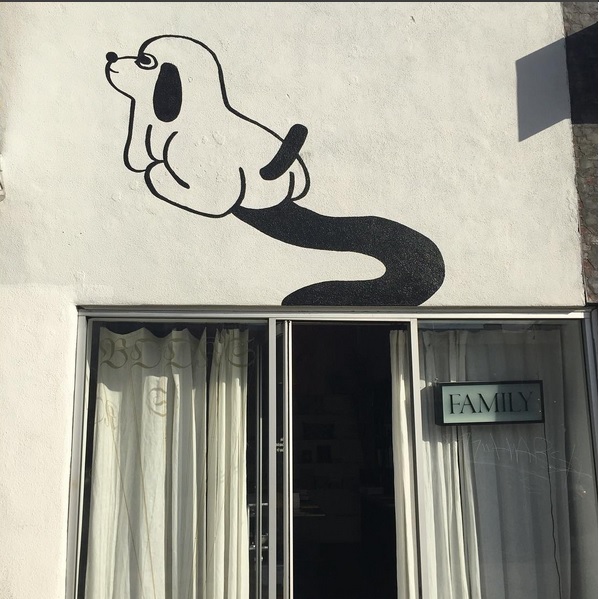 We dug a little deeper to find out what may have inspired Miley Cyrus’ puppy tattoo, and discovered that @benjamjones, one of the accounts tagged in Miley’s photo, had posted an Instagram pic of a painting on the side of a building that features a dog almost identical to the one in Miley Cyrus’ tattoo. A similar photo was uploaded by @imprintprojects, which, according to the account bio, is a group of “artists, designers and curators” who work “in partnership with non-profits, businesses and communities.” Turns out, that cartoon dog painting is a mural in Los Angeles done by Ben Jones, an artist known for his murals, comics and video art. Miley Cyrus is nothing if not loyal, and the singer has gone under the needle many times in the past for tattoos dedicated to her nearest and dearest – the weirder and more random, the better. Remember, for instance, the robot tattoo Miley had inked on the inside of her arm to commemorate The Flaming Lips’ 2002 album Yoshimi Battles the Pink Robots? With that in mind, we wouldn’t be surprised if the 23-year-old decided to get a puppy tattoo on her arm as a tribute to famed muralist Ben Jones. Stay tuned to find out if Miley Cyrus’ tattoo is real or fake!